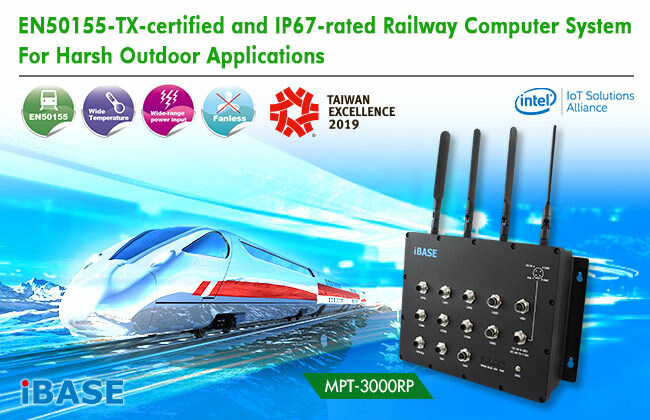 IBASE Technology, a manufacturer of application specific industrial embedded computing platforms, has announced the MPT-3000RP fanless embedded PC developed especially for railway applications. This EN50155-TX-certified and IP67-rated system, which recently received the Taiwan Excellence award, offers water and shock resistance for outdoor applications and meets IIoV, Intelligent Internet of Vehicle requirements. The MPT-3000RP is powered by an Intel® Atom™ E3845 processor with 4GB DDR3L-1333 memory onboard. Built-in M12 connectors accommodate 2x GbE, 1x VGA, 3x COM, 1x power, 1x GPIO and 1x CAN Bus. The system operates reliably with full vehicle battery power control and employs interchangeable modular power supplies supporting 9V~36V DC / 72V / 110V to meet various requirements. The unit is built with a GPS module and high computing performance to provide the most accurate position coordinates and data about the surroundings while the vehicle is moving. It is also packed with a rich set of connectivity including dual SIM sockets with WWAN redundancy, half-size Mini PCIe, full-size Mini PCIe, and three M.2 sockets for 2230, 3042, and 2280 modular card types.